The path was narrow and the streets quiet except for the distant sound of the shoes of the Geisha of Kyoto, Japan. These are women who have made a profession of entertaining with their conversation, songs and musical instruments. Many start from a very early age and make a career business that sometimes, after years, results in becoming the owner of the okiya, or geisha house. It appears that the term “geisha“, which means artist is different from the more specific term “geiko“, meaning woman of art. They leave their families to train in a strict environment. I learned these facts while traveling home from Japan recently and reading the book, Geisha of Gion written by one of the most famous geishas, Mineko Iwasaki, who has left the profession and is now married with a family. In Gion, one will find the true geiko, as we will call it throughout this writing. A Meiko is an apprentice geiko or geisha. The years of dedication expected and the modern tourist industry has made a place for the not so trained or disciplined geikos in other areas of Japan. Most modern girls find the distractions of cellphones, the internet, and the fashion world a pull when considering this difficult and dedicated career. What type of dedication are we talking about? Long hours of practice in music, song, dance,and speech are a must. Think of it as a kind of boot camp. The new geiko may have the job of cleaning the toilets or serving the other members of the household. There is a certain amount of isolation from the family, friends or those thought to be inferior. I was interested in the part of Mineko Iwasaki’s book that told of her wanting to visit a young girl in her school. This girl was blonde and was the child of an American soldier and a Japanese mother, who came from the burakumin people of Japan. These people were considered a type of “untouchable” because they handled the dead people as well as meats and leathers. They were the butchers, the undertakers, and shoemakers. As time has passed, these people do not face as much discrimination, but mostly live in ghetto type surroundings. Of course Mineko was never allowed to visit this family again. What is expected of a geiko other than entertainment? Previous years of their lives are completely spent in training. As some westerners have thought, some geikos were prostitutes; but this is not the case for the serious-minded geiko today. A virgin is looked upon highly. Her main duty is to give men a heightened sense of male ego. The geiko is taught to hang on every word of the client and to entice him into believing that he has gone to another place….outside the pressures of the real world. It is to bring good conversation, drink, food and laughter to his life. Mostly, by invitation only, the geiko meets with men for a small dinner or a banquet. The geiko may sit with high level authorities, CEO’s of great companies, and with the famous. They have learned a special type of allure and the ability to make the gentleman feel happy… all in the name of art. After the war with Japan ended in 1945, the American Occupation Forces brought the geiko and their performances back into being. It is said the General MacArthur was so taken by the beautiful kimono and obi (the sash) that he ask the geiko to give him one. However, she refused. She told him the kimono was her life and fortune. He never asked again. Another ancient form of entertainment in Japan is the Kabuki Theater. It came into being around the sixteenth century for the common people. Performed exclusively by men, some actors can trace their history in Kabuki Theater back ten generations. It is a lively performance with help of drums and singing that is different and sharp to the western ear. Also the modern Kabuki Theater, which my husband and I attended, has mercy on the “seat” of the tourist. They allow one to attend for only one hour instead of the three or four hours that Japanese find a pleasure. Great showmanship with swords and the role of the drums as the Shogun enters carries the plot. Even gently falling snow on the stage gives the audience the picture of a quiet, soft beauty of the Japanese winter. The traditions of Japan make it a unique place to visit. 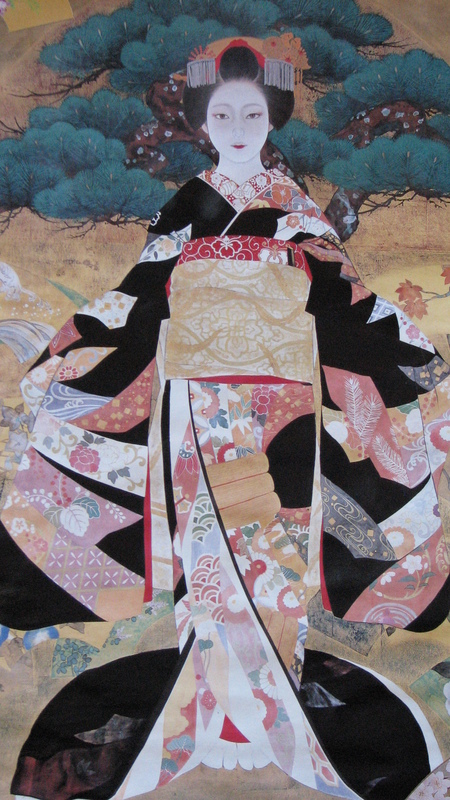 The authentic Geisha and The Kabuki in the traditional setting is found no where else in the world. This entry was posted on November 20, 2009 by Boyer Writes. It was filed under History and was tagged with culture, Geisha, History, Japan, Massacre at Sand Creek, Native Americans, WORLD TRAVEL & CULTURES, WORLD TRAVEL AND CULTURES.